2009 was a record year for jackpots and bonuses at Slotland.com, one of the world’s first and still most popular online slots sites. A total of $799,309 was paid out in progressive jackpots last year and more than $68,500 was given to players as bonuses in year end draws. That's on top of nearly half a million dollars in deposit bonuses that were paid in 2009. With the current jackpot nearing $100,000, regulars at the casino are starting to feel that another big win could be just around the corner. 2009 saw a more than 10% increase in total jackpot payouts over 2008. Averaging $133,218 in 2009, individual jackpots were larger than the year before. 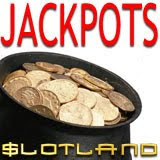 All games at Slotland are tied to the same jackpot and in 2009 the jackpots were won playing some of their most popular games: Heavy Metal, Mega Spin, Slotris, Jacks or Better and Treasure Box. The largest jackpot in Slotland history, $200,111, was won in 2009 by a player known as FORGOMO playing the Heavy Metal slot machine. That beat the previous record set by TEXASTEASER who got lucky in 2008 playing the Treasure Box slot and won $195K. Not everyone can win a jackpot but Slotland also paid out nearly half a million dollars in deposit bonuses to its players in 2009. As it has just done for 2009, Slotland will again do random year end draws for thousands more in bonus money in 2010. Each deposit is an entry (VIPs earn two entries per deposit). The draw awards a top cash prize of $5000 and splits a further $13,250 between another 20 players. On top of that, $55,000 will again be awarded to the top 30 overall depositors. Slotland.com currently features thirteen unique slot machines and three video poker games. Four of the most popular online slot machines and two video poker games are also available on mobile phones and PDAs. Slotland will soon launch new instant Flash versions, with enhanced full-screen graphics and improved sound effects, of three games: Jacks or Better, Treasure Box and Golden8.